Malta! What a place! What an absolute, unexpected, mysterious paradise! What do you picture when you think of Malta? Do you have any idea of what it looks like? Do you know any more about it other than that the film “By The Sea,” Angelina Jolie's film, was shot here? I didn’t know much about Malta before I visited. The only thing I could really picture was the tan slate brick architecture around the city. I had no idea the city was so mysterious, hilly, vibrant, and full of life. I didn’t know the sea was so pristine in some parts of Malta like Gozo and Comino. What a place to really explore and a country with an interesting history. It was one of the most intriguing places I had discovered recently, perhaps because I had no expectations, no preconceived notions, and didn’t know much about the place at all. What a lovely surprise! It’s such a mix of some of the most interesting cities in the world. It feels like Spain mixed with Northern Africa, mixed with The Middle East, mixed with France, and Portugal. It was just a mix of everything I loved about some of my favorite destinations. As much as there is beauty here in the apparent places, there is also this striking beauty in some of the old, abandoned buildings that have been completely neglected and left to decay. That is what was mysterious and so mesmerizing to me. So a little about Malta... Malta is just south of Sicily and north of the African coast. It has been its own country since 1964. Before, they were ruled by Britain hence why they drive on the right side. They use the Euro as they are now a part of the European Union (EU) and the smallest country in the EU. Most people in Malta speak English and the locals speak Maltese. To me, this sounds a little like a cross between Italian and Arabic. It has numerous fortresses, temples, and other historic sites and has some burial chambers dating back to 4000 BC. These are some of the oldest in the region. The capital city is Valletta. Other must-see cities are Mdina, Sliema, and Gozo. You could absolutely see all of these in one trip if you’re determined and get your bums out there and site see. First things first! Where to stay!? If you want to stay in a stunning small boutique hotel that has the most beautiful suites than I recommend THE COLERIDGE HOTEL. The room I stayed in was truly like something out of a castle. I felt like a princess in it! The high ceilings and stunning wallpaper were just part of its charm! The bed as well! I could go on and on. If you come to Valletta and don’t stay here, you’re truly missing out! The photos alone show how lovely the rooms were. They were huge! Max, the manager, was so attentive in helping me with my Malta plans. He was great. The breakfast room was in the basement. It was a cave-like setting and was so cute and authentic Maltese. The hotel’s location is also perfect. It’s in Valletta, right next to the main shopping street, a bunch of cute restaurants, and then the sea is just a few min walk. I love staying at boutique hotels because most of the time it’s just such a better experience and there is a lot more attention to detail. My last night in Malta, to change it up, I went and stayed at the Radisson at St. Julian’s’ Bay and although it’s a lovely property, I truly regretted leaving the Coleridge. The resort was way too packed and full of screaming children, (I love kids but not when I’m on holiday trying to relax. Haha). And was just like an assembly line of tourist after tourist coming in and out. It wasn’t authentic, and I felt like I was anywhere else in the world. BORING! Don’t do it! Now, what is there to do in Valletta you ask!? Well, go walk your little bum around and see. I say this in many blogs, but the first thing I do in a city is to go out and GET LOST! Go! I find the coolest things when I just start walking around. Valletta is full of cute, hilly streets full of character, it’s full of banners and garlands of décor, and has many grand churches. I would allow a whole day to really explore the city. The first thing to do is walk to the Upper Barrakka Gardens in the old city. Here you will get a panoramic view of the city. They also fire canons every day from the Saluting Battery at noon and 4 pm with a great ceremony, so be there for that! Another site to see is St. John’s Co-Cathedral which is really a beautiful church to see. If you want old, then go to The Church or St Paul’s Shipwreck. It’s one of the oldest in Valletta and that’s saying a lot as there are over 350 churches in the country. Truly no shortage of them. You can quickly jump over to the Siege Bell War Memorial, especially at sunset which is nice! 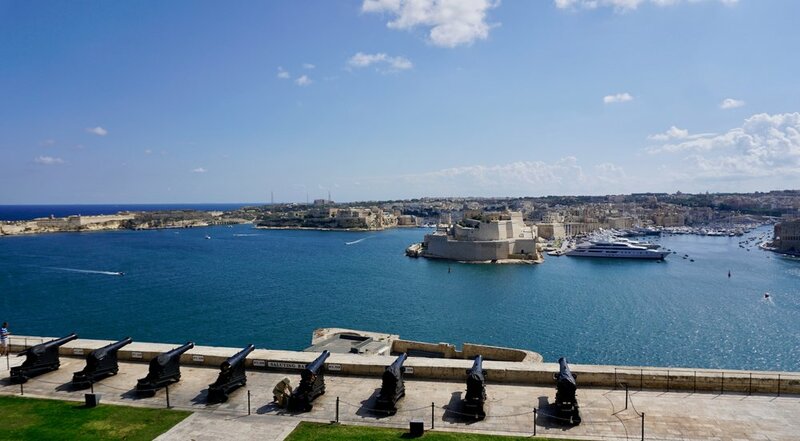 You can check out St. George Square as well as Hastings Gardens and Grandmaster’s Palace, and for the guys, well there are loads of museums they can check out especially The National War Museum and Fort St Elmo. There really is something here for everyone! It’s a great city to just walk around and really take in! A cool place to go at night for dinner and explore is The Three cities. Birgu is the oldest of the cities and the most beautiful I think. A few great restaurants over there are Osteria VE, Del Borgo, Enchante, and Panorama. You don’t even need to be here in the evening. You could take a ferry over and explore and get lunch, it’s beautiful! If you want to see water as blue as the Maldives then make your way to Comino, to the blue lagoon! The beach is super touristy and not so desirable to spend all day as when I say it’s crowded, I mean like imagine 5000 people on a super tiny beach with no room. However, you MUST go and explore the water and get in! It’s warm and pristine! There are some pretty rock formations out there and the diving is AMAZING! My friend even saw an octopus while he was diving. One thing you MUST do if you go to Comino is to call my friend Tony for a boat ride there. He will pick you up from any hotel on the coast and get you there on his small boat cheaper than taking a taxi to that side of the island or a way-too-packed ferry. He will blast his music, tell you hilarious jokes, have his three cute dogs on board, and he will even take you through some of the private lagoons and sea caves all again cheaper than a taxi and ferry back! Trust me, I get no kick-back from Tony. I only adored him after he drove us back from Comino in his boat. His Boat company is Oki-Ko-KI Banis! He’s been doing it for forty years and loves his job! His email is tonibanis@gmail.com. Ok back to Comino... so just go there and expect nice water, but know you won’t have much room to lay out. I would say if you arrive super early before the party ferries arrive at 10 am, you’ll be good. Next time I will go out about 6 am and get some awesome photos, but hey, you live and you learn, right? Bring cash for the water taxis and the food and drinks there. Expect some overpriced drinks, but hey get a pineapple drink! It’s all about the photos, anyway, isn’t it? Hahahaha! Another must do is Mdina. It’s a stunning old city in the North of the island that used to be the capital of Malta back from the antiquity to the medieval period. It’s super pretty, lots of great restaurants, views, and of course, great for photos. Rabat is a town just near and also beautiful. Mdina is still confined to its city walls! It’s truly incredible! You can walk around it and have a nice lunch and explore. Give yourself a half day to see both Mdina and Rabat. Also try the wine there! Amazing! The nickname of Mdina is “The Silent City” in case you hear someone say that! How cool!? It sounds so mysterious! The first thing you must do in Mdina is to see St. Paul’s Cathedral. Some more notables are Palazzo Falson and Palaza Gatto Murina, The Mdina Dungeons, The chapels like St. Agatha’s, St. Nicholas, and St. Roque’s. If you like museums the National Museum of history is there, I don’t love museums to be honest unless there is a specific thing inside I want to see but I’ve heard great things about it if it’s your cup of tea! I think the coolest thing if you’re a little morbid like me or love archeology and history, is the catacombs and tombs in Mdina! All in all, for such a small country there really is so much to see and do and such a variety! You really need to put Malta on your list of places to go. You can fly there for quite cheap and the city is fairly cheap as well. The people are so jovial and outgoing and the weather is, of course, beautiful and warm. If you’re trying to escape the start of winter, get here. I came in October and it was still so hot! I loved this little country and I will absolutely be back to visit when I can explore even more and I’m scuba certified as really the diving is amazing if you’re a diver you don’t want to miss out! You could see an octopus! How cool! Well, I think it is anyway!